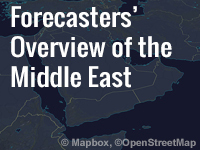 This lesson provides an introduction to the Middle East for Navy meteorologists. It focuses on the major aspects of synoptic and mesoscale weather patterns, hazards to aviation and maritime operations, geography, oceanography, and climatology. The “Geography” Unit covers major political boundaries, cities, ports, topographical features, rivers, and seismicity. The “Oceanography” Unit includes major bathymetric features, mean sea surface temperature, vertical temperature profiles, salinity and velocity, ocean currents, and tidal ranges. The “Climatology” Unit covers the seasonal climatology of jet streams, synoptic weather systems, extratropical cyclones, and monthly and seasonal statistics of high winds and seas. The “Weather Events” and “Hazards to Operations” Units cover dust storms, hazards to personnel, and other marine and aviation hazards. The lesson will take around two and half hours to complete (not including the quizzes). Good introduction to the weather in the Middle East. Loved the games and questions. The lesson was very good for learning purposes of the region.It has greatly increased my understanding of the Middle East. Way too long. It could have been broken into two modules. One including the geography and terrain and the other the resultant weather. Very interesting units for learning about the Middle East.I have really enjoyed the lesson. Great lesson! Very comprehensive information, and the games and questions helped me learn the information. The test makes sure you know your stuff. Lesson is fine but pre-assessment and quiz are poor, with repetitive and ambiguous questions. Hope they will update that. Oceanography and Bathymetry of the marginal seas in the region, with an emphasis on the Persian Gulf and Arabian Sea. Identify the synoptic patterns associated with high winds and seas (12 feet or greater/gale and storm force winds).